If it's made of carbide, ceramic, steel or other hard materials, we make it! R and M Machining Co. takes pride in meeting your quality, delivery and production needs. 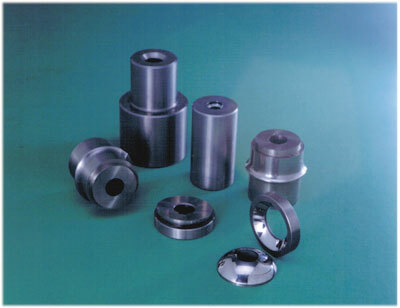 R & M designs, manufactures and sells a full line of high quality solid tungsten carbide precision drill bushings. Special application carbide bushings are designed and manufactured for gun drilling, circuit board, punch and die assemblies, automotive drilling heads and cut off. R and M Machining Co., Inc. capabilities include manual and CNC milling, turning, drilling, centerless grinding, OD and ID and surface grinding, honing, lapping, brazing and automatic wire and sinker EDM. our production facility is arranged and staffed to handle high volume production needs and small quantity, quick delivery needs. In-process inspection procedures ensure that each operation is performed to the exact specification and tolerances you require. Whatever your needs, from subcontracting intermediate operations or complete design and manufacturing, R & M Machining has the capabilities to meet your needs. Our environmentally controlled quality department is equipped with modern dimensional measuring instrumentation to ensure high and uniform quality products and services. We have an excellent reputation in all major industries because of our unique and highly versatile capabilities for a wide range of work in small or large production quantities. R & M produces various products for customers around the world.